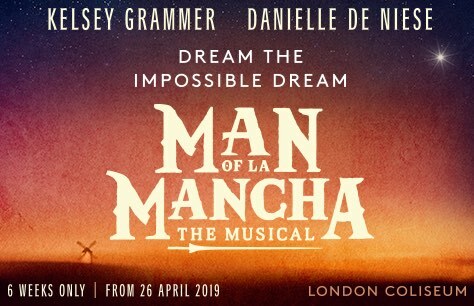 Tony Award-winning musical Man of La Mancha returns to the West End in 2019 for its first major London revival in over 40 years. Multi-award winning actor Kelsey Grammer will lead this semi-staged concert production as Don Quixote and as his faithful servant Sancho Panza. Inspired by Miguel de Cervantes’ seventeenth-century masterwork Don Quixote and set during the Spanish Inquisition, Man of La Mancha features classic numbers including “The Impossible Dream,” “I, Don Quixote,” “Dulcinea,” “I Really Like Him” and “Little Bird”. Following the critically acclaimed productions of Chess , Sweeney Todd , Sunset Boulevard and Carousel , Michael Linnit and Michael Grade in collaboration with English National Opera present Man of La Mancha. Man of La Mancha will play a strictly-limited West End season from April 2019 at the London Coliseum. Awaiting trial Cervantes is hailed before a kangaroo court of his fellow prisoners; thieves, cutthroats and trollops who propose to confiscate his meagre possessions one of which is the uncompleted manuscript of a novel called “Don Quixote.” Cervantes, seeking to save it, proposes to offer a novel defence in the form of entertainment.